Miss this and miss the opportunity to have the relationship God designed us to share. 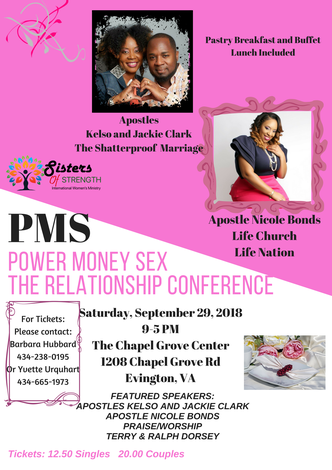 Apostles Kelso and Jackie Clark and Apostle Nicole Bonds use life experiences and biblical strategies to help you build a Shatterproof relationship. Anointed Praise and Worship with The Waller Sisters and other Spirit filled Praise teams. Enjoy a pastry breakfast, buffet lunch, extraordinary door prizes, powerful teaching, laughter, tears and a questions session with the speakers and conference round table panel. This event will also give you the opportunity to complete your Christmas shopping with numerous vendors and crafters on sight. The Clarks are renounced for their teaching on marriage and relationships through their “Shatterproof Marriage” platform. Apostle Nicole Bonds is the founder of the Life Church and Life Nation (5 Churches under the Life Nation headship) and Exousia Global Fellowship. She is also an author and world traveled speaker and minister of the Gospel.